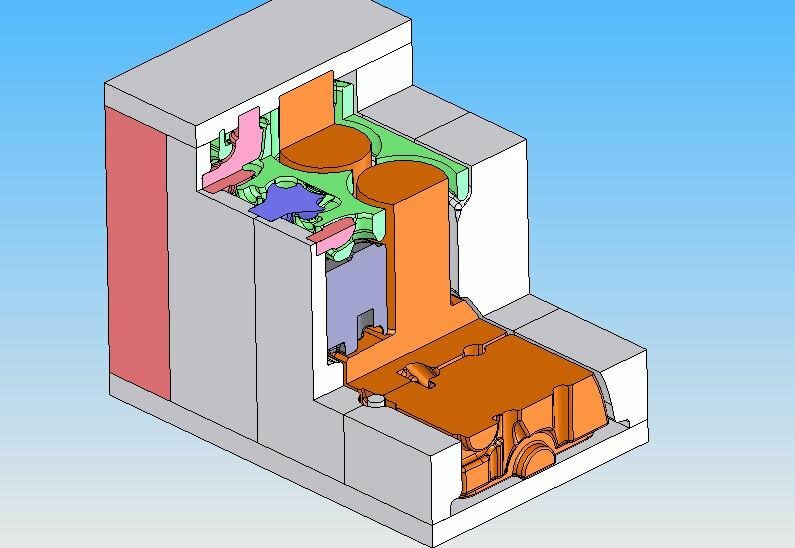 Unlike the other engineering and illustrations in this article that show parts, the engineering and illustrations of the new cylinder block show voids. The reason for this is to make the engineering easy to implement at the foundry. If you were to send a drawing (or solid model) of the cylinder block to a foundry, the first thing that the foundry engineers would have to do is design the core boxes that are needed to create the sand core for each of the cavities. In the case of this new cylinder block, seventeen uniquely different cores are required. The other advantage to modeling the voids instead of the actual part is that undercuts and other unsuitable geometry that would complicate core box construction can be avoided. 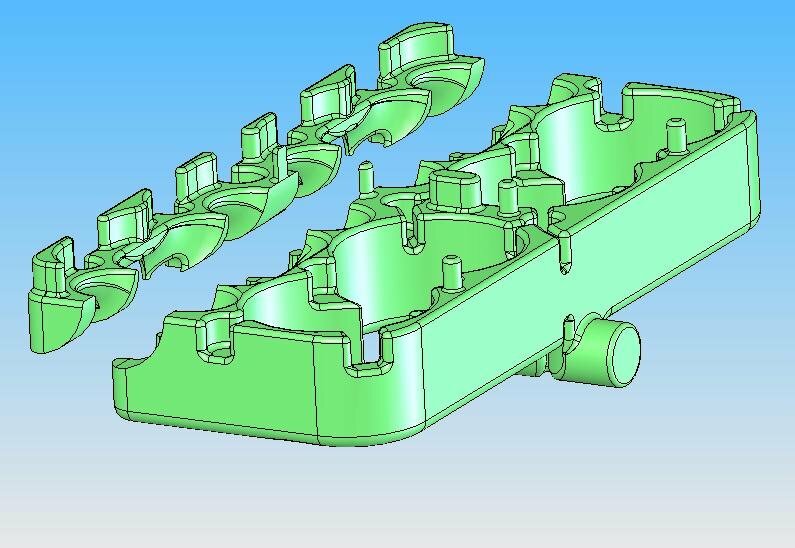 In this design study, each cavity was modeled separately and then combined into an assembly. The assembly of solid models was then checked for wall thickness and interference, and adjacent models (cavities) were checked for compatibility (feature location). Figures 10 and 11 above illustrate the assembly of solid model crankcase cores. The exhaust port cores are red, the intake port cores are blue, the water jacket core is green, the valve chamber and timing gear cores are gray, and the cylinder and crankcase cores are brown. These cores will become the hollow areas of the new cylinder block. All cores of the new cylinder block are designed to provide 150 inch of extra material at each of the machined surfaces. This extra material is called "machine allowance" and is the nominal amount of material that is removed at the machine shop. The extra protrusions shown are called core prints. A core print is an extension of a core that will fit into a corresponding recess of an adjacent core that will both position and hold each core in proper orientation. The water jacket core is comprised of two parts that come together on an interface that follows the swept centerline of the valve ports. This split is necessary for two reasons. 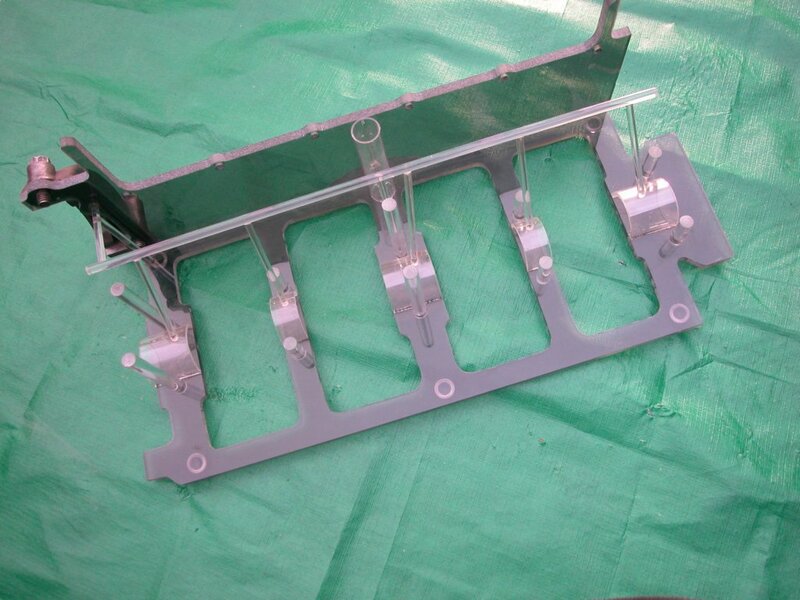 The first is to provide clearance for assembly of the valve port cores, and the second is to simplify water jacket core box construction. The water jacket core in the new cylinder block is identical to the water jacket core found in a stock engine with the following exceptions. 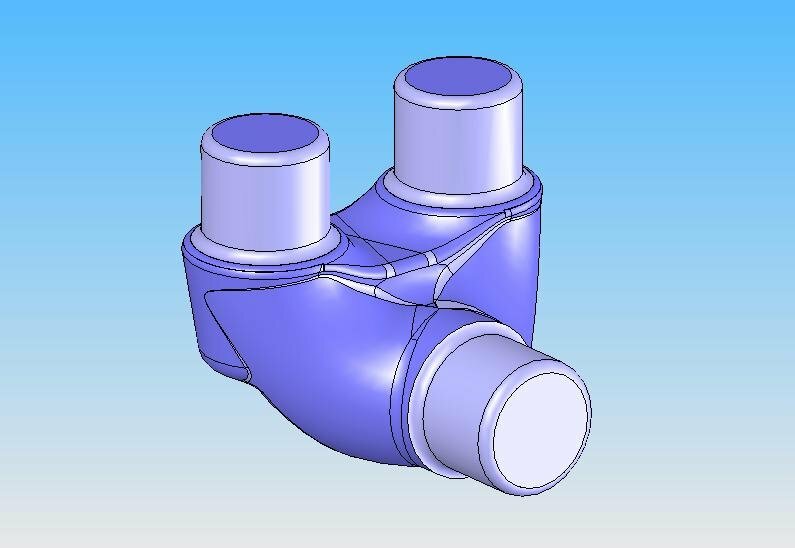 The intake passage contour has been changed to follow the new streamlined intake port cavity described below, and the exterior has been made smaller by 1/32 inch to accommodate the 3/16-inch exterior wall described below. Figure 12 shows the upper and lower water jacket cores. Figure 13 shows four of the five exterior cores that will determine the shape of the exterior of the cylinder block. The top core is not shown. They match the exterior of the cylinder block described on the original Model A drawing with the following exceptions. The original drawing did not show parting lines. Parting lines are where foundry cores come together and usually result in a thin fin of excess material on a casting that must be ground off. Parting line location was determined by measuring several original cylinder blocks. When comparing the drawing to several original cylinder blocks, it was noted that several fillet radii and other small features did not match. These items were evidently left to the discretion of the original pattern makers. The solid model created for this study is a combination of the drawing and these deviations. It should be noted that an original cylinder block could be laser scanned to create an exact solid model. This is discussed later on under "Status of Engineering". Three minor changes occurred to the exterior of the cylinder block during the spring of 1929. The length of the serial number boss was increased to 3 ¼ inches as the 1 millionth Model A was produced, the two bosses at the rear of the cylinder block used for throttle mechanism attachment were changed to one long boss, and a small bump was added to the exterior of the rear cam bearing to provide wall thickness for the new oil hole feeding the camshaft. There are no other known exterior changes through the end of production. 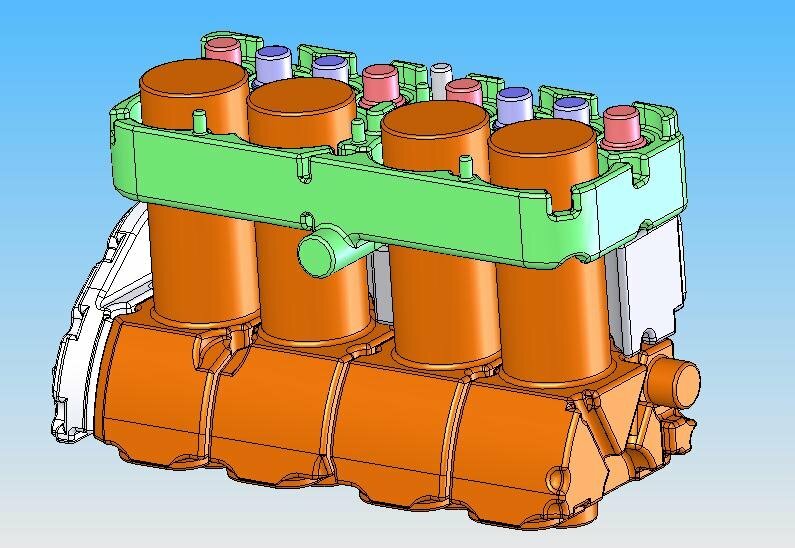 The new cylinder block described in this engineering study features these changes. By changing the exterior cores shown in Figure 13, cylinder blocks for earlier configurations are possible. In a stock Model A engine, all wall thickness is 5/32 inch with the exception of the rear main wall, which was thickened twice during production to a final nominal thickness of 5/16 inch and the cylinder walls which are ¼ inch. In the new design cylinder block, all wall thickness is 5/32 inch with the following exceptions. The exterior water jacket wall and the main bearing webs all have 3/16 inch walls, the rear main bearing wall is 5/16 inch, and the cylinder walls are ¼ inch. The new design cylinder block also has larger ribs at the rear wall for added strength. The front main bearing web on a stock Model A engine is close to the rear of the bearing. This new design cylinder block has the web centered on the main bearing for added strength. The following cross sections, Figures 14 and 15 with various cuts show many of these walls. The intake ports and valves in a stock Model A engine are 1 3/8 inch diameter and have a 5/32 inch wall to water jacket. Although the intake valves in a Model B engine are the same 1 3/8 inch size, the intake ports are 1 ½ inch diameter with the same 5/32 inch wall to water jacket. Attempting to enlarge or straighten the ports on a stock Model A engine is not advised since the water jacket becomes very thin. 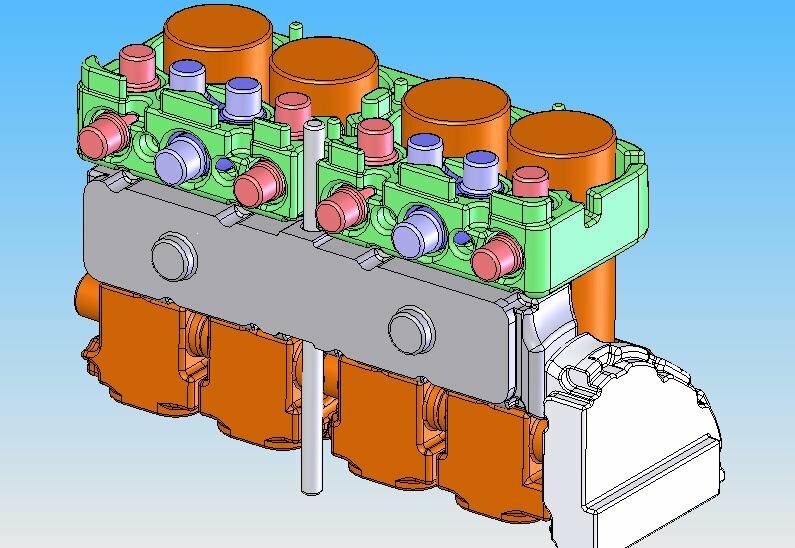 The new cylinder block maintains all stock interfaces and basic dimensions in regards to the valve train. Nothing is changed from a Model A engine except as follows. The intake ports of the new cylinder block are the same larger size as a Model B engine, and the intake passages of the new cylinder block have been streamlined and straightened by reducing the total number of bends. 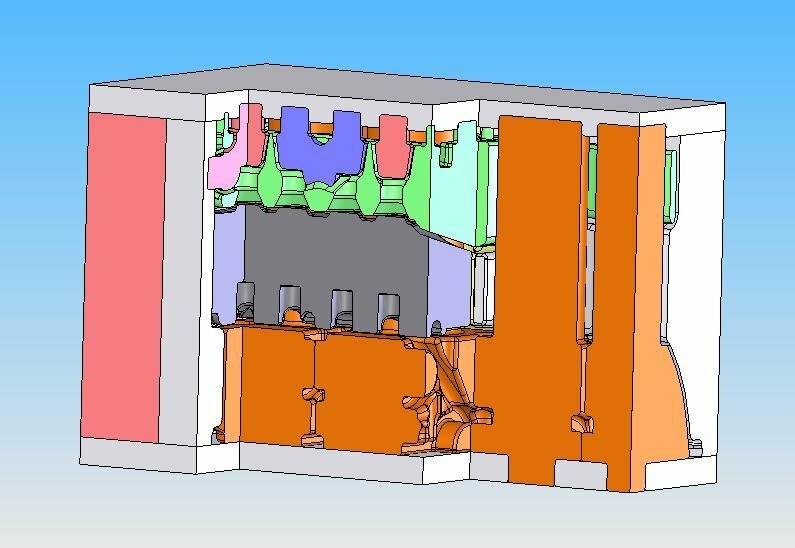 In the new design cylinder block, the intake charge flows into the intake port, and then makes an immediate horizontal 45 degree turn either left or right, and then a 90 degree vertical turn to get to the underside of the intake valve (total angular change is 135 degrees). The intake port in a stock Model A or B engine continues straight for a short distance before making the turn towards the valve (total angular change is greater than 135 degrees). Figure 16 shows the new cylinder block intake port core with its’ streamlined passage. The exhaust valve seats in the new design cylinder block will be hardened steel. The new cylinder block has five cam bushings. The cast iron bosses in the new cylinder block that support the camshaft have been enlarged from stock to provide room for the replaceable bronze bushings. Each of these bushings has a 1.562 inch ID and a 2.000 inch OD. This wall thickness at the rear bushing provides enough material for an o-ring groove and face seal at the interface between the new cylinder block and the flywheel housing. As a result, the flywheel housing gasket (A-6396) and flywheel housing to cylinder shims (A-6400) are no longer required. The center cam bushing is sealed at both the fore and aft ends with radial lip seals (National #473694) to minimize leakage and maintain oil pressure. The Model A engine has a primitive lubrication system. Oil is pumped from the oil pan to the valve chamber and from there, drains to the main bearings by gravity. Excess oil pumped into the valve chamber runs down the oil return pipe assembly (A-6645) where it flows into a tray (A-6688). From this tray, dippers on the bottom of the connecting rods scoop oil for lubrication. On startup, Model A main bearings suffer from a lack of lubrication because all of the oil in the valve chamber has drained back to the oil pan by gravity, and it takes a short period of time for the oil pump to replenish the oil in the valve chamber. The Model B engine has a better system with low pressure to the mains, but still has dippers on the connecting rods. The G28T engine is greatly improved over Model A and B engines by having a full oil pressure system with a drilled crankshaft so that all bearings received pressurized oil. Preliminary oil galley and feed line routing for the new cylinder block was worked out on paper, and then made into an acrylic full-scale model to 3-dimensionally demonstrate routing and clearances. A photograph of the model is shown in Figure 17. 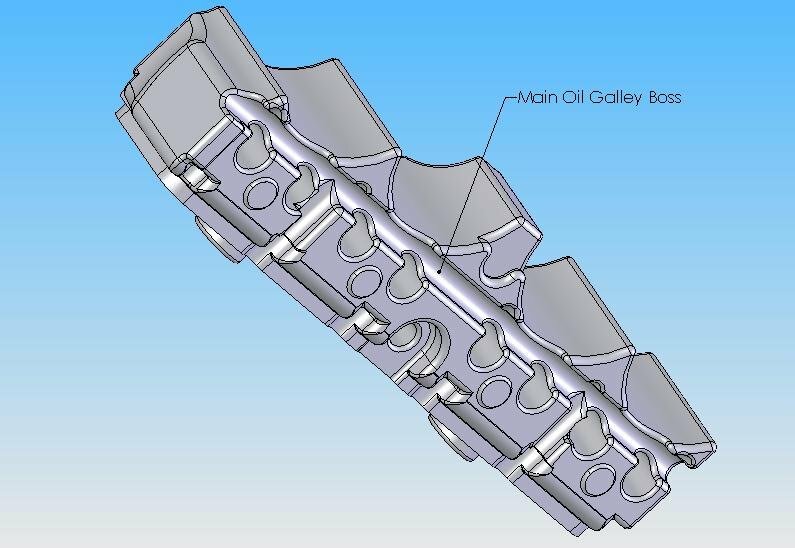 Oil distribution in the new cylinder block is from a 5/16 inch diameter full-length horizontal main oil galley in the valve chamber located between the cylinders and tappet bosses. Figure 18 (a sectional view taken at the centerline of the front main bearing and looking towards the rear) shows the location of the boss for the main oil galley. It also shows a diagonal groove running from the main oil galley boss to the front main bearing that will become a boss and be drilled to supply oil. Similar bosses are also designed into all five main bearing webs to accommodate drilled oil passages that will supply pressurized oil from the main oil galley to both crankshaft and camshaft bearings. Main bearing oil passages will be 1/4 inch diameter and camshaft oil passages will be 1/8 inch diameter. Model A and B engines have pressed in steel tubes for oil passages that are not on the centerline of the main bearings. This new design cylinder block has the oil passages centered on the main bearings. Other bosses that will become oil galleys to route oil from the oil pump to the main oil galley are provided. These bosses (oil galleys) are designed to permit oil routing with or without an external oil filter and they have been positioned to be in line with specific bolt hole locations for ease of plumbing. For instance, if an external filter is desired, oil exits through the stock pipe plug found on the oil pump side of the cylinder block, goes through the filter and then is routed back to the main oil galley through a series of drilled passages that are inboard of the lower bolt that attaches the timing gear inspection cover (A-6017). Of course, this lower bolt (A-21111) would have to be drilled and tapped for the return oil line from the filter. On engines not using an oil filter, all routing is internal through drilled passages and nothing shows from the outside. Whatever the routing, there are no pipes, tubes, hoses or fittings internal to the new cylinder block. The vertical height of the new main oil galley was positioned at the same height as the lower row of valve chamber cover bolts. Bosses are provided and drilled behind two of these lower cover bolts. The purpose of this is to allow a pressure tap for an oil pressure gauge that will read directly from the main oil galley (If the lower cover bolt is drilled and tapped for a fitting). On a pressurized (modified) Model A engine, the oil pump must be sealed to the cylinder block and fastened in place. 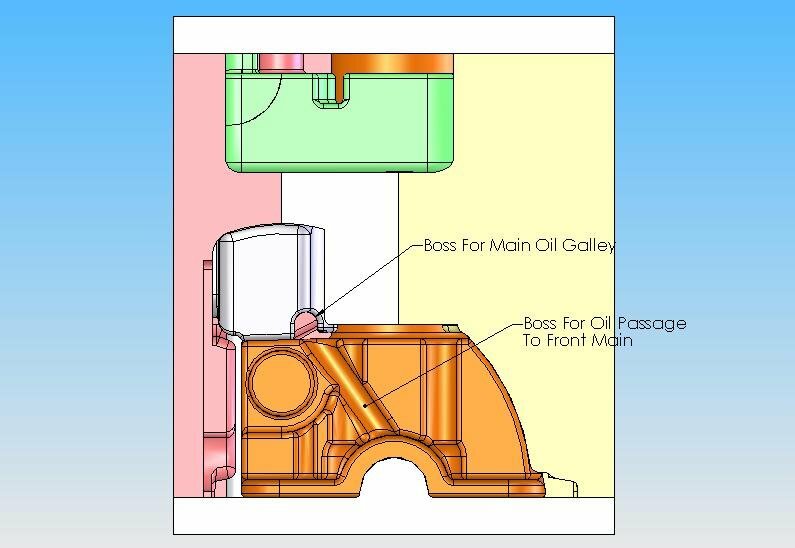 Sealing on the new cylinder block is accomplished with an o-ring that fits in a groove in the cylinder block bore where the oil pump plugs into, and a boss is provided in the center main web for a bolt and dog type clamp to fasten the oil pump. The front and center main bolts also have an o-ring seal in the cylinder block to keep pressurized oil from leaking up and out at their castellated retaining nuts. 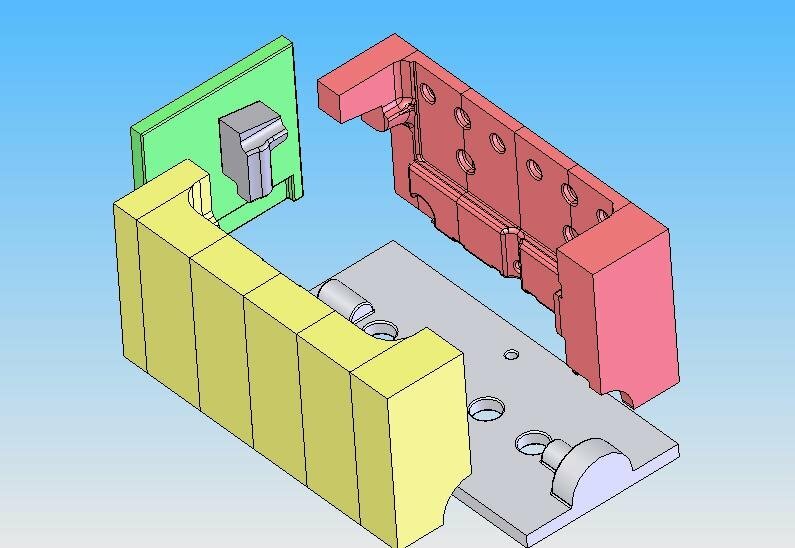 Extra material has been added to the main bolt bosses to accommodate the o-ring grooves. Figure 19 is a view of the underside of the valve chamber cavity core and shows the recess (between cylinders and tappet bosses) that will become the full-length oil galley boss.